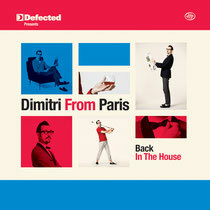 Late-August sees Dimitri From Paris deliver 'Dimitri From Paris Back In The House' - a double CD mix that sees the laidback maestro fusing material from the likes of Soul Clap, Storm Queen, Miguel Campbell, Tiger & Woods and Marshall Jefferson into pitch-perfect disco-infused beatdown. When it comes to disco Dimitri From Paris is a genuine authority; a gentleman DJ who loves an image yet eschews spectacle in favour of fastidiously executed musical selections drawing on four decades of glorious music. A global and hugely popular DJ for no other reason than he can educate and create a real party at the same time, Dimitri is a modern-day maestro who has fans that span the spectrum, from 'heads' to occasional musical thrill-seekers. Recapturing that ‘lost happiness’ is at the core of his latest endeavour. Coming in two parts, a live recording recorded at the gritty and intimate London venue, The Horse & Groom, and a studio mix coming directly out of Dimitri's 'mansion' in Paris. 'A Night at The Horse & Groom' shows Dimitri in the finest of form. No studio trickery, it's a DJ playing from the heart with skill and passion. From the opening, Moog-laced funk of Soul Clap's 'Take It Slow' to the infectious energy of closer Elz & Elise 'Soul Power' (MKTL Master Kev & Tony Loreto Club Mix), it's a mix that pairs the contemporary with the classic in celebratory style. Weightier in terms of punch but equally as light in tone as its counterpart, 'A Night at Dim's Mansion' takes in a powerful and emotive trip through a more strident, house music vibe. A 'Real' house music mix that oozes class from the likes of Mr V, Sébastien Tellier and Dimitri himself, it's memorable, timeless and entertaining fair. Dimitri is one of a seemingly dying breed; a refined, heritage-based DJ and producer who can remember better than most ‘how they used to do it’; the days when there was big money to be made – and subsequently poured into – the dance music market. Out 27th August on Defected Records.